Good, lasting relationships take time. That’s true whether you are talking about your spouse, your co-workers, or your family dentist. We understand that at Mid-Michigan Dental Excellence. Dr. Thomas J. McDonald, our dentist, wants every family in and around Alma, MI, to receive the best dental care we can offer. That’s why family dentistry is an important part of our practice. We want to see every member of your family smile, and we want to help you keep those smiles as healthy as possible. Schedule a consultation to learn more about our approach to dental care. Call 989-796-4848 or contact us online. 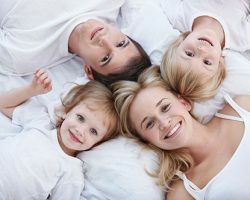 Every member of our staff at Mid-Michigan Dental Excellence knows that your family is the most important thing in your life. You want to know the people who are caring for the people who you care the most about will be doing their best. When you come to our office, you will find a relaxed but compassionate atmosphere. We know that many children may find the dentist office intimidating at first, and we will ease them into dental care. When a 2 year old comes to our office for his or her first dental visit, we take everything at a pace so that he or she feels comfortable. And we won’t do anything unless your child is ready. In some cases, that first dental visit consists of a child meeting the dentist and other members of our staff. In other cases, we are able to do a complete cleaning and examination. We want your child to know that we care about him or her. We will let your child work up to receiving full dental care. We have found this helps us build long-term relationships with our youngest patients. If someone in your family is old enough for his or her first dental visit, call us to make an appointment. In a way, family dentistry is general dentistry for anyone of any age. Once your child gets his or her first tooth, you child can develop tooth decay. We don’t want that to happen, and we’re sure you don’t either. As you get older, you will be more likely to develop gum disease and cavities as well. Our staff at Mid-Michigan Dental Excellence has the experience and the training to meet the dental needs of every member of your family no matter how young or how old. Of course, we encourage preventive dental care for every patient. We would prefer to give you a couple professional cleanings and examinations a couple times a year. However, we are prepared to fill cavities, repair broken or damaged teeth, and treat gum disease when the need arises. Regular visits to our office will help us monitor your oral health. Even if we find a problem, we are more likely to catch it in the early stages if you visit us every six months or so. We will remove any plaque or tartar buildup. We will check for cavities and signs of periodontal disease or other oral health problems, and we can take X-rays to track any changes in the alignment of your teeth or your children’s teeth. Your visits for cleanings and examinations also are opportunities to answer any question you may have about your oral care at home. We can show your kids how to brush and floss, and we can answer questions about food and drinks that can affect your oral health. We hope each member of your family makes time to brush their teeth (twice) and the floss between their teeth and gums each day. Daily habits make a huge difference in your long-term oral health. We also know that children sometimes eat too much sugar, and they may not brush as carefully as you would like. They may ever “forget” to brush and floss sometimes. Our team at Mid-Michigan Dental Excellence may be able to help with that, too. Ask about getting dental sealants and fluoride treatments during your next dental cleaning. Sealants create a barrier over your children’s molars. These are the teeth in the back of your mouth, and they are the teeth that are most likely to develop cavities. The sealant helps to keep the bacteria that cause cavities away from the small crevices in those teeth. Fluoride is a mineral. When it is applied to your teeth, it can both repair minor damage and strengthen your enamel. This is another way to reduce your family’s risk of developing cavities. Call 989-796-4848 or use our online appointment form to make your appointment at Mid-Michigan Dental Excellence.